FEIN Dustex Fleece Filter Bags x5 (For Dustex 35L) - ONLY £22.39 (+VAT) - SAVE £3! INCREDIBLE OFFER! RRP: £393 (+VAT). SAVE £158 OFF RRP! 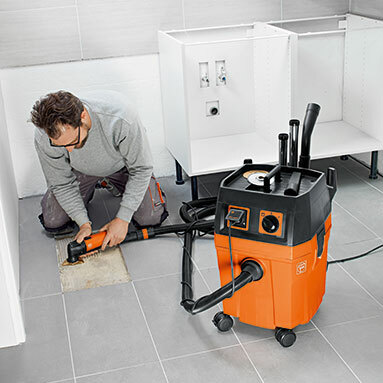 Fein Dustex 35L Wet and Dry Vacuum Cleaner 110v - powerful wet and dry vacuum cleaner that connects to power tools for dust extraction when working in confined spaces. This FEIN dust extractor is the ideal companion for Fein Multimaster power tools! With M Class filter! Please note that the machine itself is L class, but the M class filter provided allows filtration to M class standard. The machine does NOT have an audible alarm when the suction drops, so can't be described as an M class machine.